During a recent holiday in Waikiki, a beach front neighbourhood of Honolulu in Hawaii, EV News took the opportunity to rent a Nissan Leaf for the day. Having scanned the available cars on the Enterprise Rent-A-Car web-site and noticing they had Nissan Leaf available and for approx the same price as others in the same bracket I couldn't resist test driving one. Having just hopped out of a Prius the controls in the Leaf were immediately familiar. It wouldn't be a wild guess to say the mouse-shaped gear selector in both could be sourced from the same supplier. The start procedure in both is almost identical too, put the wireless key in the centre console, foot on the brake pedal, push button to start, select 'D' on the 'mouse', foot parking brake off, push the throttle and start moving forward - silently. Aside from the steering wheel being on the wrong side of the car and having to drive down the wrong side of the road, (we're RHD here in Australia) we were still a bit navigationally challenged after only a few days in Hawaii. For a start, we hadn't been able to source an old fashioned paper road map of the place and being cheap skates (read: having a strong aversion to being ripped off) neither my better half nor myself had set-up International roaming on our iPhones so consequently they only worked when-ever WiFi was avaliable. Infrequent checking of Google maps required a quick visit to the nearest McDonalds to use their free WiFi. Of course, the Leaf has GPS as standard built into the dash but a) you can't type in an address unless stationary (which frustrates the passenger no end) b) the address look-up isn't as good as Google and more often than not failed to return a result so it becomes a two device routine to actually find the route to any particular land mark. I soon discovered range anxiety is real, at least within the first hour of driving an unfamiliar car. Like any typical Hawaiian day it was 30c so having driven out of the hire car lot and straight onto an expressway with the air conditioning on (i.e. maxium possible energy consumption)... the range indicator started to fall rapidly. 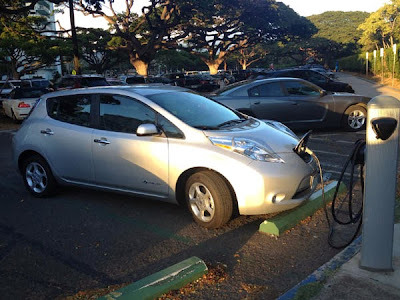 Obviously if you owned a Leaf you would soon grow accustomed to it's range capabilities, but in unfamiliar terrain and in an unfamiliar electric vehicle, straight off the bat, it's all an unknown. When we got the keys the range indicator said 84 miles (134 km). We hit a few outlet stores, hill climbed the 1,186 feet (361 meters) elevation to the Nu'uanu Pali Lookout, in the process depleting indicated range to less than 20 miles by the summit - which we regenerated back up to 37 miles (60 km) by the time we returned to our hotel by late afternoon. Fortunately Hawaii has plenty of accessible public changing stations, which most of the time are very popular. (see above) Even though the parking itself isn't free, the charging is and as luck would have it, there was a charging station within 5 mins walk of our hotel. It was available when we arrived with our Leaf (although it had been ICE'd by a minivan – who promptly moved and starting asking questions about the Leaf) and after a quick 3 hours plugged in we set off for dinner with the dash showing 100 miles (160 km) of range. When confined to level ground, city driving, as opposed to expressways and hill climbs, the Leaf consumes amazingly little energy. What you use during heavy acceleration is mostly regenerated while pulling up at the next set of traffic lights. 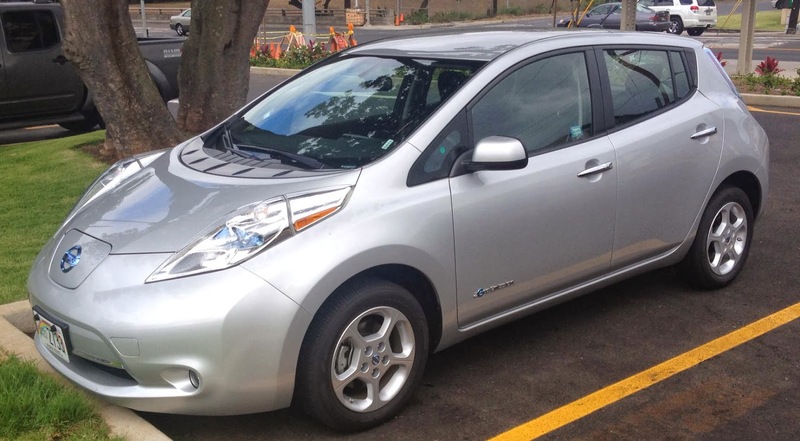 The leaf has the same blended brake set-up as the Prius and Volt so any use of the brake pedal kicks in more regeneration as opposed to dissipating energy through the friction brakes. In fact, having driven 2 full laps of Ohau in a Prius, I now understand why Prius owners are often quoted as saying brake wear is minimal even after 200,000 km as like the Leaf and Volt, the Prius uses full regen braking most of the time. Incidentally, on a recent trip to Darwin to cover the World Solar Challenge it was interesting to note 80% of the taxis in Darwin are Prius – frugal on both fuel consumption and brakes - sounds like a perfect combination for a taxi. From a drivers perspective, due to the “pedal feel simulator” in most hybrids and electrics, it's hard to tell the difference between regn and friction braking based on pedal feedback alone. The tell-tale is watching the dash displays ramp up to full any time the brake pedal is pressed while the vehicle is at speed. For urban driving the Nissan Leaf is a great choice. 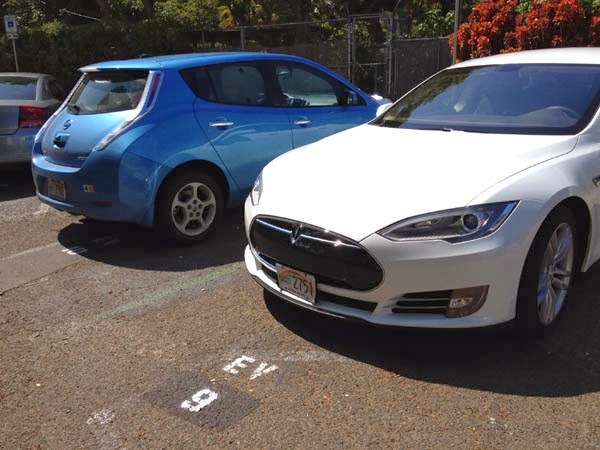 It's surprisingly big for a 'small' car, costs virtually nothing to run, takes only a few hours to get back to fully charged on a 240v outlet and as we have seen with DC fast chargers it can easily cover 500 miles (800 km) in a day.